Today I am super excited to share an easy yoga morning routine and tips to stay healthy and fresh feeling throughout the day. I'm not a yogi by any means, but warming up as often as I can with yoga is so refreshing! Whether I have a day filled with outdoor activities like hiking or traveling, or indoor activities like blogging or cleaning up the house a good stretch can set the day right. So, let's begin! I've found that the easiest way to get into yoga is by memorizing a series of movements, in today's case a Sun Salutation. Underneath each photo you will find a detailed description of the pose and how to correctly move into the next pose. If you have any comments or questions, please leave them in the comments below! We'll start with Mountain Pose, or Tadasana. This pose is usually a beginning pose to a series of stretches. When done correctly, it should be using almost every muscle of the body to stand tall. It can even improve posture over time and reduce back pain! Stand tall, feet pointed in front of you, chest open and shoulders relaxed. 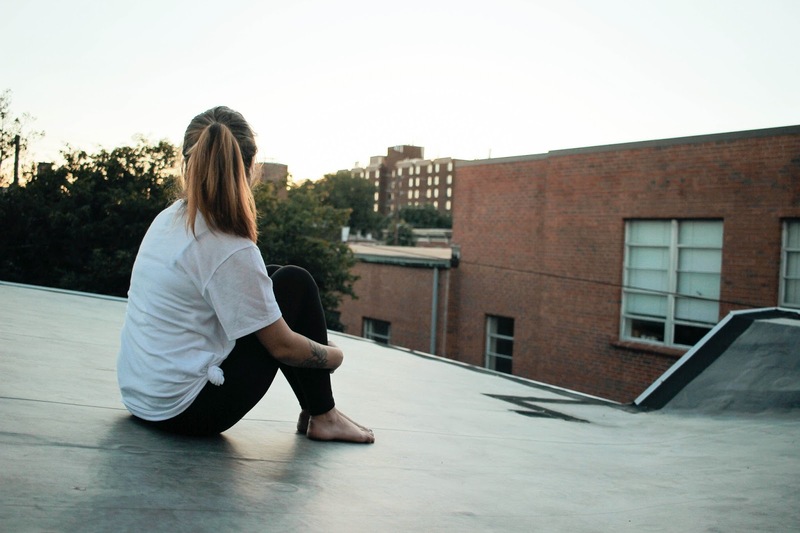 Breath in deeply and on the exhale move to step 2. Urdhva Hastasana is the next pose. 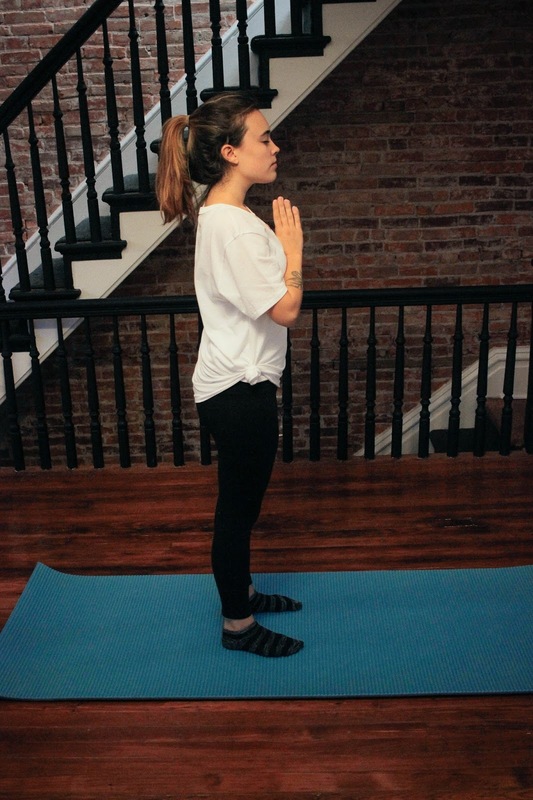 As you exhale slowly from Mountain Pose, lift your arms into the air above your shoulders on the next inhale. Make sure you relax your shoulders (I often forget this but its important!) and lift your gaze to your fingertips. Be sure to slide your shoulders down away from your ears, slightly bending your elbows if need be. Ardha Uttanasana. Inhale and lift your head, bringing your gaze forward. Make sure that your neck is relaxed. 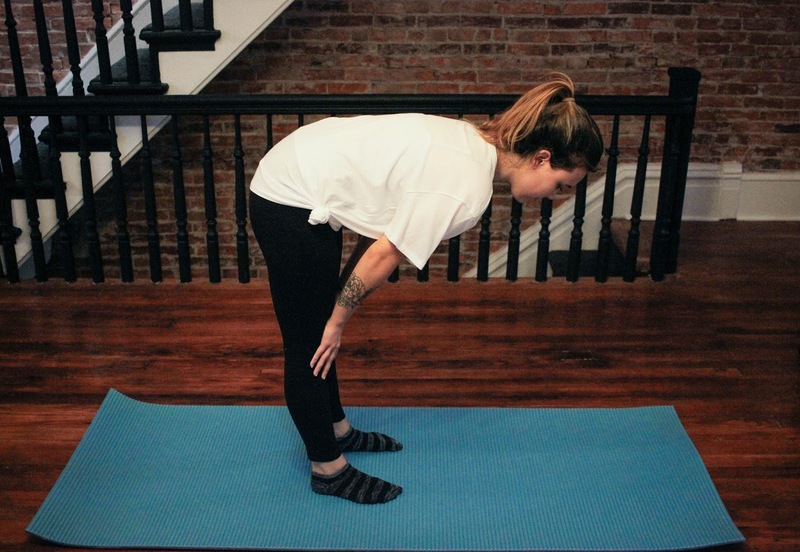 Bring your fingertips to the floor or higher up on your legs to get your back flat. Exhale slowly and move to the lunge. Lunge. Inhale and bring your hands to the mat, underneath your shoulders. Flatten them and spread your fingers. Bring your right leg to the back of the mat and come into a low lunge, as this will get your into your plank. Plank. Bring back your left foot and hold yourself on your toes. Plank position tones the abdominal muscles while strengthening the arms and spine. Remember to keep breathing while holding yourself in this position for two deep breaths; legs, buttocks, and back all aligned. 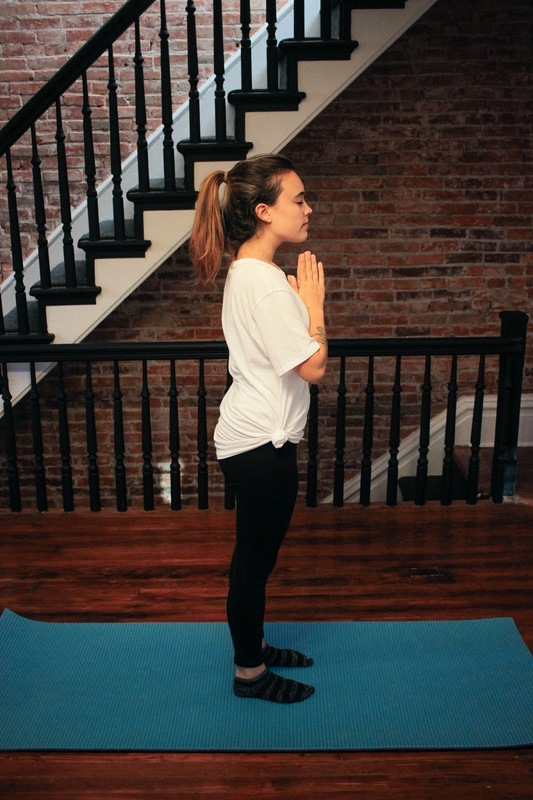 *If you have carpal tunnel then practice this pose on bent knees instead of your toes. Chaturanga Dandasana. Exhale and shift your weight from the plank and lower yourself, bringing your shoulders slightly in front of your wrists (sort of like a push up). This is a transition into the pose pictured above, Upward Facing Dog. Roll over your toes until you're on the tops of your feet. Bring your shoulders away from your ears and breathe in. Straighten your arms, lift your thighs and knees off of the floor and gaze upwards. Hold for one breath. 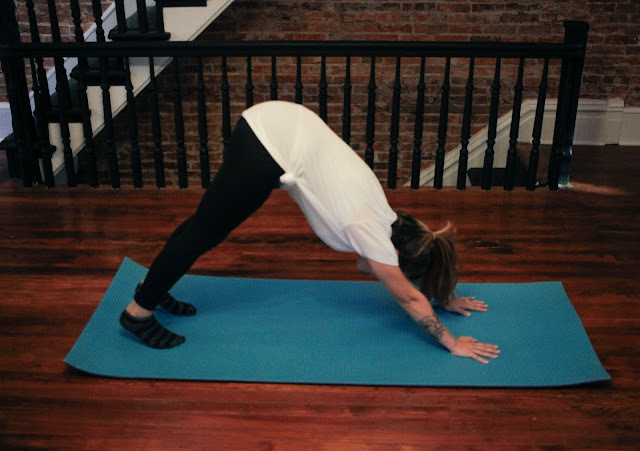 *If you're unable to do this with your thighs and knees off the mat, you can opt for the cobra pose. Downward Facing Dog. 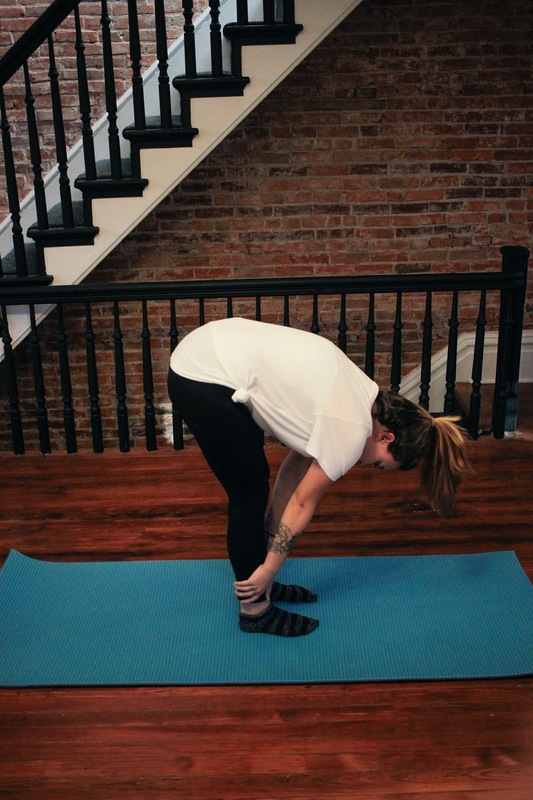 Exhale, then push back into this pose. Pedal your feet to stretch your leg muscles and get your heels as close as you can to the mat. They don't have to touch, although some people can because they're flexible! Do what works best for your body. Make sure that your back is straight, not arched, and your ears are aligned with your arms. Stay here for a few deep breaths. Uttanasana. (Forward fold) Inhale up to the same pose we did earlier. 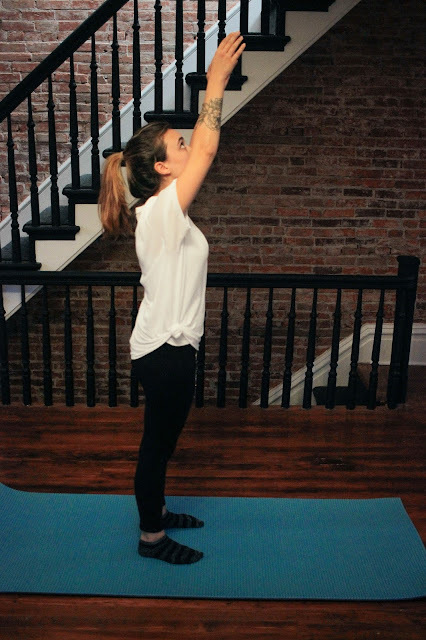 Place your hands flat on the mat with fingertips in line with your toes, or place your hands where you can. Pictured is what hands on your shins/above your knees would look like. 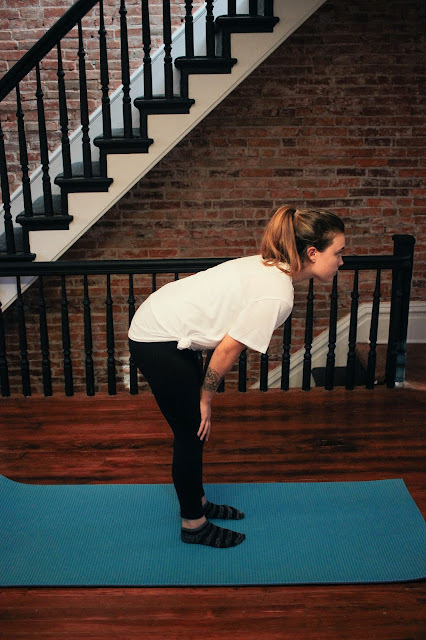 Don't lean into your knees, keep your belly tight and back straight while breathing. Then slowly as you inhale, vertebrae by vertebrae, lift yourself up and raise your hands to the sky for Urdhva Hastasana. Remember to keep your shoulders relaxed and chest open. Exhale down to Mountain Pose and bring your hands to heart. Repeat this series of movements 4-5 times for a full work out. After my sun salutation, I always try to get myself a cup of coffee and then hop in the shower. 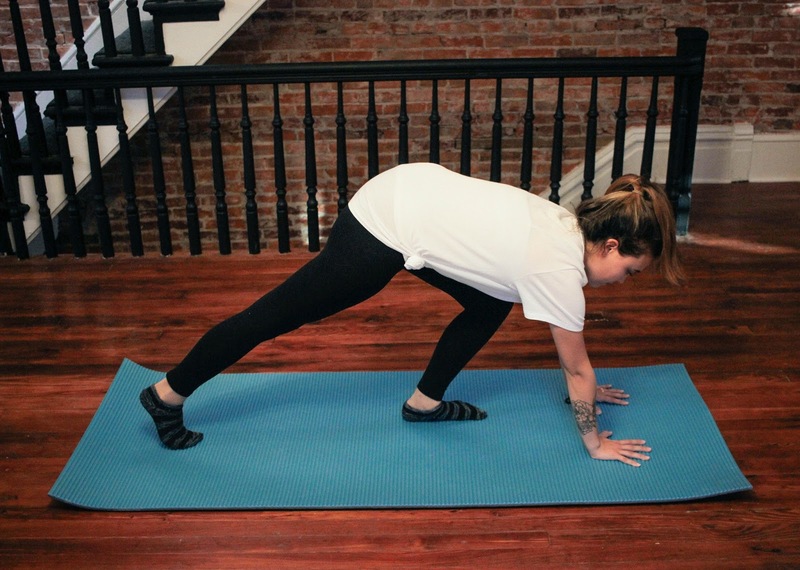 If you've never done yoga before you might not think that you'll work up a sweat, but you do! It feels so good! After a yoga session, I feel like I've released negativity and unhealthy toxins in my system, so it's important that I replace them with healthy skin care products. This is where Mother Dirt comes in! I've been using Mother Dirt Cleanser, Shampoo, and AO+ Mist for a few weeks now and I've already begin to notice a difference. I feel like we are so addicted to being clean that we've stopped reading the ingredients in our shampoo and soaps. Things like perfumes, unnatural chemicals, and dyes aren't going to benefit our skin in the slightest, so why are we using them? 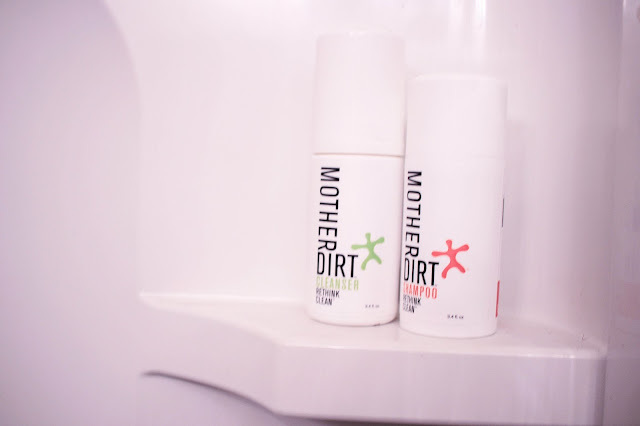 Mother Dirt products help me maintain a balanced microbiome in my skin. The improvements I've seen include a better look to my skin, a more hydrated feeling in both my skin and my hair, and a change in the oily-ness of my skin. It's helped me cut costs on all these different cleansers and soaps and moisturizers too! What's great about the Cleanser and Shampoo is that my husband can use it too. It's not fruity or "girly" smelling, just clean and fresh and takes special care of your skin's biome! I also use the Mother Dirt AO+ Mist before my workout and after my shower. I try to use it 2x a day for optimal freshness! The mist contains a live Ammonia-Oxidizing Bacteria which helps replenish the good bacteria in your skin that is lost with modern hygiene. Just like our stomach needs good bacteria to stay healthy, so does our skin! I spray it on my armpits, my face, my feet, and my scalp. 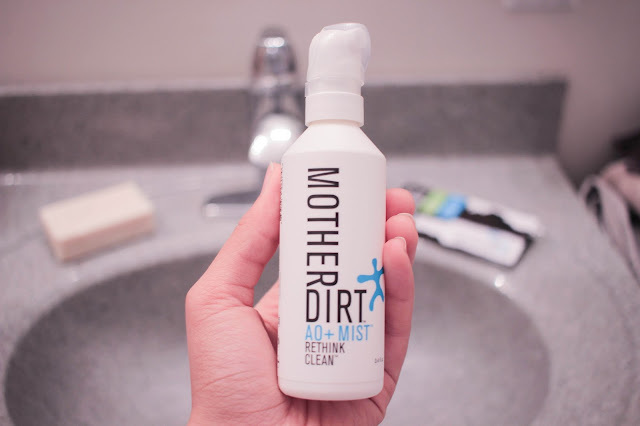 What should you expect once your start using Mother Dirt products? That's a question I had when I began and here's what I've found: a decreased dependence on deodorant, soap, and shampoo. My skin and hair feel more hydrated and balanced and I also feel like I'm taking care of myself and of the environment by using natural, healthier alternatives! Be sure to use my coupon code "CBNATALIE25" to save 25% when you try it out for yourself! As you continue your yoga practice, I urge you to keep moving forward and to try new poses. Yoga with Adriene is a great channel I follow on YouTube that has a 30 Day Challenge as well as tips and poses for you to try! Have you tried Mother Dirt Skincare? I would love to know what you thought and how it's benefitted your skincare routine! Pretty article! I found some useful information in your blog, it was awesome to read, cobra pose thanks for sharing this great content to my vision, keep sharing..